Now that we’re in the throes of summer here in Odessa, that means hot temps, wind, blowing dust, and more bugs flying into your windshield. Even with the increase in daily rainstorms in July which offer a free car wash, the elements and yucky bug splatters can make it difficult to keep your windshield clean. At West Texas Windshields, we want to help you keep your windshield, side windows, and rear windows clean to ensure safe driving all summer long. We have composed a list of some helpful and easy tips for keeping your windshield clean. Please continue reading below. This might seem like the most obvious way to help keep your windshield clean, but for most people, windshield wipers are often neglected. First, you’ll want to invest in a decent pair of windshield wipers for your front windshield, and, if applicable, for the rear windshield. Purchasing durable windshield wipers doesn’t mean they have to be the most expensive wipers on the market, as there are many affordable, high-quality blades that will last. Rain-X and Michelin are two brands that make quality, cost-efficient wipers that are worth the investment. You’ll want to change your wiper blades every six months for safety, however, if they’re leaving bad streaks or appear to be falling apart, change them sooner. Another way to maintain optimum windshield wiper function is to clean the blades regularly. While cleaning them with soap and water works, it’s best to use rubbing alcohol or mineral spirits and a lint-free cloth to wipe the edge of the blade. This will help remove any debris or residue from the blade, which will help reduce streaking on your windshield. Be sure to clean your rear windshield wiper blade, too, as the rear blade often becomes caked with more debris than the front wipers. This is another obvious step to keeping your windshield clean, however, it’s good practice to top off your fluid regularly, and make sure the fluid hose is functioning properly. With all of the different kinds of wiper fluid out there, it’s best to pick an affordable, all-season wiper fluid which will help protect your windshield from all the elements, whether it be rain or sun. Also, try adding a washer fluid additive which will improve the efficiency of your wiper fluid, enhance visibility, reduce streaking, and clean your windshield of tough, stuck-on bugs and other debris. Additionally, be sure to check the plastic fluid container under the hood for cracks, chips, or leaks. You’ll want to replace it if you notice any issues. Also, it’s good idea to check your hose line for leaks, especially if you notice your container is full but no fluid sprays on your windshield, or if you find a puddle of brightly-colored fluid underneath your vehicle. It’s easy to spray wiper fluid on your windshield with the push of a button or the turn of a switch, but it can be challenging to make time to spray and wipe down the interior of your front and rear windshields. The inner windshield can become dirty or streaky due to condensation that builds up overnight after a rainstorm, from humidity, and also becomes caked with dust. It’s best to wipe down your interior windshield, side windows, and rear windshield for best visibility. While ammonia is a common ingredient found in many household cleaning products because of it’s ability to cut through grease and other touch residues, it can harm tinted windows, and is terrible for your car’s interior. When cleaning the interiors of your car windows, it’s best to avoid using ammonia-based cleaners and instead opt for ammonia-free glass cleaners, which won’t damage the plastics, vinyls, leathers, or tinted windows. A microfiber cloth is an affordable investment that makes cleaning your interior and exterior windshields and side windows a breeze. If you need a quick wipe-down to improve visibility, a high-quality microfiber cloth provides gentle, yet efficient scrubbing action and can be used with or without cleaning solution. 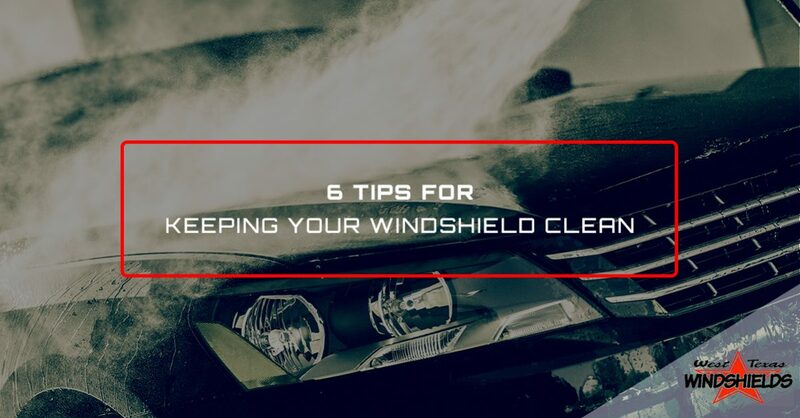 At West Texas Windshields in Odessa, we want to help you keep your windshields and side windows clean and free of obstructions to keep you, your loved ones, and others on the road safe. Please call your Top Rated Local® windshield experts today if you’d like to schedule an appointment for windshield or auto glass repair. We’re happy to help you with all your windshield and auto glass repair and replacement needs.